Bat-Eared Foxes have a body length between 46 and 66 cms (18 - 26 inches), a tail length between 23 and 34 cms (9 - 13.5 inches) and they weigh between 2 and 4.5 kgs (4.5 - 10 lbs). As their name suggests they have huge, wide ears that can be up to 12 cms (4.7 inches) in length. Their face is small and they have a short, pointed muzzle. Their coat is tawny to grey in colour with dark legs, ears, muzzle and mask around their eyes. Up to 80% of their diet consists of insects and their teeth have adapted to suit this lifestyle. Their teeth are small and they have up to 8 extra molars to grind the hard casings of the insects which they eat. This brings their total number of teeth to 48, which is more than any other non marsupial mammal. 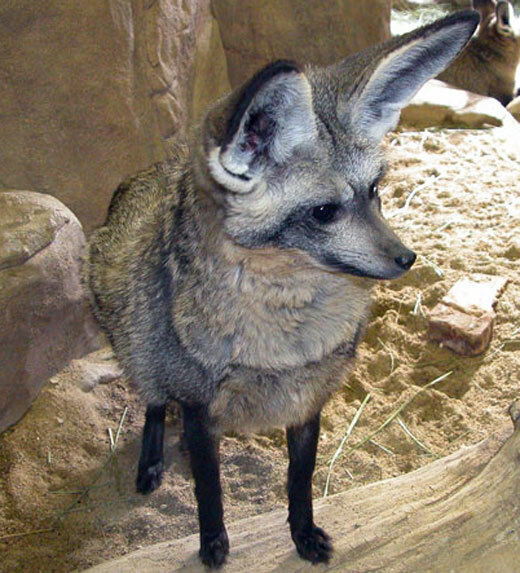 Bat-Eared Foxes are found in the grasslands and savannahs of east and southern Africa. They live in pairs or small family groups and they inhabit dens that have several entrances, chambers and several metres of tunnels. The population in east Africa have home range of 0.25 - 1.5 sq.kms (0.09 - 0.58 sq. miles) that they mark with urine. In southern Africa home ranges extensively overlap and they are not marked. Bat-Eared Foxes breed between September and November and both parents take part in rearing their young. After a gestation period of 60 - 70 days, 2 - 5 young are born in a den. At 9 days old they open their eyes and when they reach 17 days old they begin to venture from the den. At 1 month old weaning begins but they may continue to suckle from their mother until they are 3 - 4 months old. By the time they are 5 - 6 months old the youngsters are full grown and they reach sexual maturity at 9 months old.